And he taught me how to hunt! From what the Illuminati have done! And I was taught not to use a gun! Nor to use a trap! For what they have all done! And I hunt their Illuminati Skin for what they have done! When the cat has gone bad! From the Skin that I will have! Is what is killing everything alive! And make sure that all of them will die! That I used to hunt the Bugs Bunnies with! When the governments come in! But to never kill a Human Being! Even in the wars that they have made for me! We do not even know their names! I see them all over the place! To control the United States! With the Euro they did make! Canada, United States, and Mexico is next to take place! They have robbed most of the World! To be opposed upon the entire World! It is time to kill the Illuminati on this World! So that they never can rule the World! I will never fear what they will say! For we are the ones to fear each day! Kill the Illuminati our way! While he hunted for his Rabbit each day! With the New World Order World! So that Elmer Fudd will be remembered from us all! But now all of the Rabbits are all now gone…. ELMER FUDD LOVES BUGS BUNNY…. 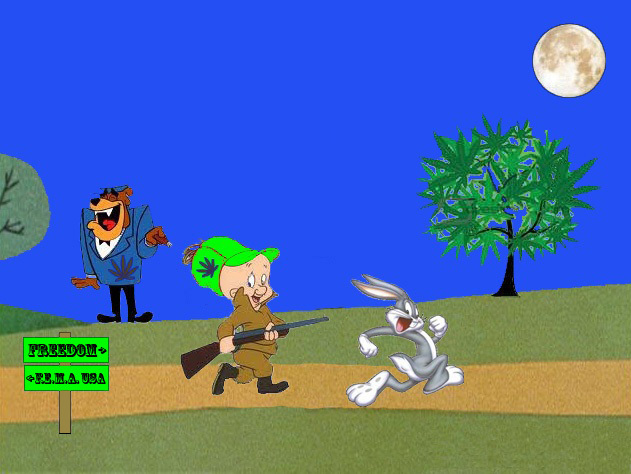 ELMER FUDD'S GRANDSON POEM HAS NO COPYRIGHTS, AND IS HEMP FREE FOR PUBLIC DOMAIN USE. BUT, IF YOU USE THIS POEM, FOR SONG LYRICS, ECT., PLEASE WRITE, "WRITTEN BY; THE ONE WHO CARES, ABOUT YOU...."